As seen, for example, in Fig. 2.7, excitation of a nerve fibre involves the rapid depolarization of the membrane to a critical level normally about 15 mV less negative than the resting potential. The critical level for excitation is the membrane potential at which the net rate of entry of Na+ ions becomes exactly equal to the net rate of exit of K+ ions plus a small contribution from an entry of Cl- ions. Greater depolarization than this tips the balance in favour of Na+, and the regenerative process described in Chapter 4 takes over and causes a rapidly accelerating inrush of sodium. After just subthreshold depolarization, when will have been raised over an appreciable area of membrane, the return of the resting potential will be somewhat slow at first, and a non-propagated local response may be observed. At the end of the spike the membrane is left with its sodium permeability mechanism inactivated and its potassium permeability appreciably greater than normal. Both changes tend to raise the threshold for re-excitation. The partial inactivation of the sodium permeability system means that even to raise inward Na+ current to the normal critical value requires more depolarization than usual, and the raised potassium permeability means that the critical Na+ current is actually above normal. Until the permeabilities for both ions have returned to their resting levels, and the sodium permeability system is fully reactivated, the shock necessary to trigger a second spike is above the normal threshold in size. It has long been known that nerves are not readily stimulated by slowly rising currents, because they tend to accommodate to this type of stimulus. Accommodation arises partly because sustained depolarization brings about a long-lasting rise in potassium permeability, and partly because at the same time it semi-permanently inactivates the sodium permeability mechanism. Both changes take place with an appreciable lag after the membrane potential is lowered, so that they are not effective when a constant current is first applied, but become important after a little while. They also persist for some time after the end of a stimulus, and so are responsible for the appearance of post-cathodaldepression, which is a lowering of excitability after prolonged application of a weak cathodal current. As a result of accommodation, cathodal currents that rise more slowly than a certain limiting value do not stimulate at all, since the rise in threshold keeps pace with the depolarization. Another familiar phenomenon is the occurrence of excitation when an anodal current is switched off. This anode break excitation can readily be demonstrated in isolated squid axons or frog nerves, but is not seen in freshly dissected frog muscle or in nerves stimulated in situ in living animals. The conditions under which anode break excitation is exhibited are that the resting potential should be well below EK because of a steady leakage of potassium. The nerve can then be considered to be in a state of mild cathodal depression, with gNa partially inactivated and gK well above normal. The effect of anodal polarization of the membrane is to reactivate the sodium permeability system and to reduce the potassium permeability, and this improved state persists for a short while after the current is switched off. While it lasts, the critical potential at which inward Na+ current exceeds outward K+ current may be temporarily above the membrane potential in the absence of external current. When the current is turned off, an action potential is therefore initiated. Divalent ions like Ca2+ and Mg2+ strongly affect the threshold behaviour of excitable membranes. In squid axons, even a slight reduction in external [Ca2+] may set up a sinusoidal oscillation of the membrane potential, while a more drastic reduction of the calcium will result in a spontaneous discharge of impulses at a high repetition frequency. Conversely, a rise in external [Ca2+] helps to stabilize the membrane and tends to raise the threshold for excitation. 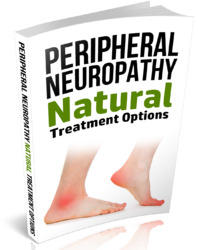 Changes in external [Mg2+] have rather similar effects on peripheral nerves, magnesium being about half as effective as calcium in its stabilizing influence. 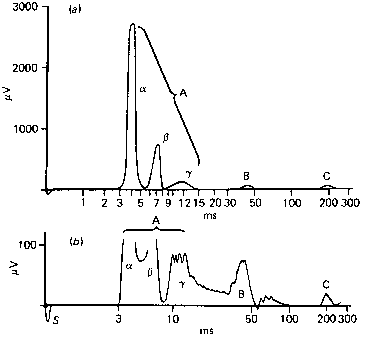 Voltage-clamp studies by Frankenhaeuser and Hodgkin (1957) have shown that the curve relating peak sodium conductance to membrane potential is shifted in a positive direction along the voltage axis by raising [Ca2+], and is shifted in the opposite direction by lowering [Ca2+]. However, the resting potential is rather insensitive to changes in [Ca2+]. This readily explains the relationship between [Ca2+] and threshold, since a rise in [Ca2+] moves the critical triggering level away from the resting potential, while a fall in [Ca2+] moves the critical level towards it. A moderate reduction in [Ca2+] may bring the critical level so close to the resting potential that the membrane behaves in an unstable and oscillatory fashion, and a further reduction will then increase the amplitude of the oscillations to the point where they cause a spontaneous discharge of spikes. Although calcium and magnesium have similar actions on the excitability of nerve and muscle fibres, they have antagonistic actions at the neuromuscular junction and at some synaptic junctions between neurons, because calcium increases the amount of acetylcholine released by a motor nerve ending, and magnesium reduces it. Changes in the plasma calcium level in living animals may therefore give rise to tetany, but there is a complicated balance between central and peripheral effects. What are the factors that affect threshold voltage? What is the excitation threshold of a neuron? Does a fall in calcium level move critical triggering level towards resting membrane potential? Why did nerve fibres have a low threshold for excitation? What factors determine the action potential threshold? What are threshold membrane potential? What type of stimulus cause the least threshold for excitation in a nerve? How does calcium affect threshold? How threshold potential can be changed? Why membrane potential is reduced to a critical level during threshold? What affects threshold of an action potential? How to lower membrane potential threshold? How to lower action potential threshold? Is a lower membrane potential easier to reach threshold? What is the membrane threshold potential for the neuromuscular junction? How does na affect action potential threshold? What causes threshold of excitation in a cell? What affects neuron threshold voltage? What can reduce action potential in nerves? What factor can vary threshold potential?